1. Most furniture in this post is from the Loft. 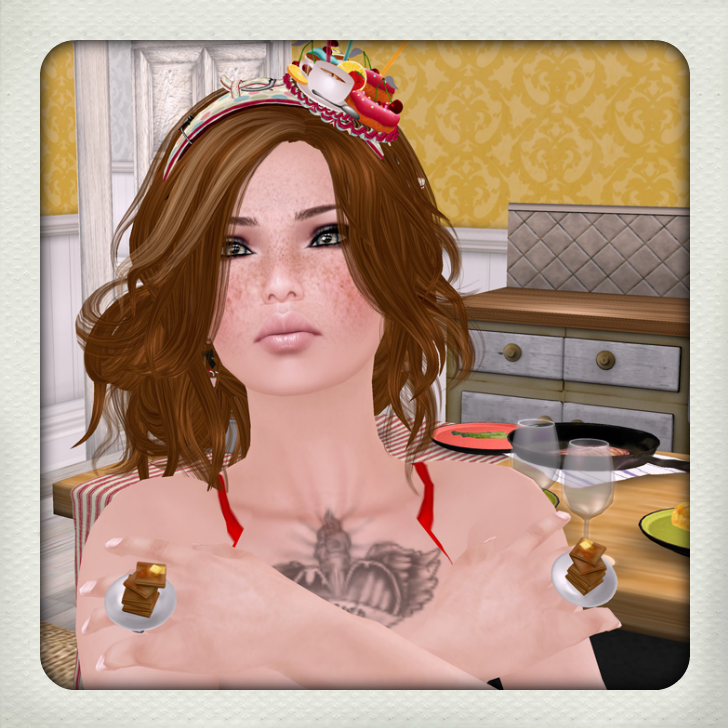 These pics were taking in my SL Kitchen… gluttony = food. The house is the Lali House by La’Liscious. My poses are from Hopscotch poses available at the Festival of Sin and they are adorable. 2. This skin is lovely and only 250L at Exodi’s booth at the festival of sin. The Sophie Skin comes with two makeups, freckles and cleavage options for cheap, cheap cheap. Please tell Ms. Beck to release the rest of em. 3. Brand new Maggie hair from Truth Hawks. Rawr. My little hat is from Lou Lou & Co. at the Festival of Sin. 4. The cutest sushi lingerie in the world possibly is from Schadenfreude at the festival. 5. Also the cutest boots possibly in the world in this lovely red color that is exclusive only to the Festival of Sin are form Gos. Seriously.. when he makes boots the ladies are like cats around a bowl of cream. There is almost nothing better. Gos boots are epic. This is gorgeous hair. Tasmine is a brand new release from Truth hair. It reminded me of being at the beach and that the summer is coming to an end. There is a still a bit of time to get to the beach though before summer comes to an end. My top and bikini are from Kyoot. The necklace is from Miel. The skin is Curio. The Pose is Del May. Glam Affair is no stranger when it comes to making gorgeously touchable skin. My first thought when I put on this skin is “striking”. I like the fine attention to detail and the underlining speckled freckles dusting the cheeks as a sweet afterthought. The lips are bold and marvelous and seemingly quite different from the first Jadis. They seem more life like to me and more compelling. I like the different choices of make up too. With each skin Aida Ewing perfects her craft more and more. Below I have a small sampling of makeup in each tone from the lightest shade to the darkest. It goes Light, Natural, Medium Tan, Tan, and Dark. I am also wearing brand new hair from Lelutka called “Office”. My dress is by Malt and is called “Ready to Mingle”. All poses are by Glitterati. 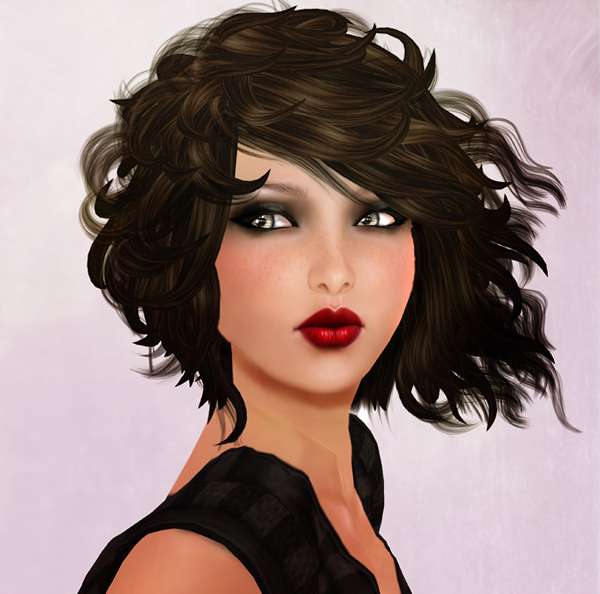 The skin is of course by Glam Affair in Jadis 2. I don’t do this often but I have to say.. Truth Hawks I love this hair. You don’t know me and that is ok but just know when I saw this hair hit the grid yesterday i knew that it had to be mine. Good job. I am also wearing my current favorite skin by Pink Fuel called Elly with the cherry lips that come with the skin as a tattoo layer (Firestorm for the win) and The eyeliner is from Boom at Kozmetica.. and I think that Boom makes some of the best tattoo layers for your eyes that you can get. The shirt that I’m wear which you can’t see much of is from Grixdale.. who is sadly closing but is also have a super fabulous sale. The pose that I used for this is from !Bang.